How do we grieve the dead when their lives are frozen in time on social media? This is but one of the many issues of life and death explored in Seen/By Everyone, the latest play from San Francisco’s Theatre of Yugen. This is truly theatre that cannot be seen anywhere else. As San Francisco continues to watch its art institutions and performance venues shutter their doors due to high costs and changing demographics, Theatre of Yugen has managed to hold on, offering one of the last chances to enjoy intimate, thought-provoking theatre in the city. 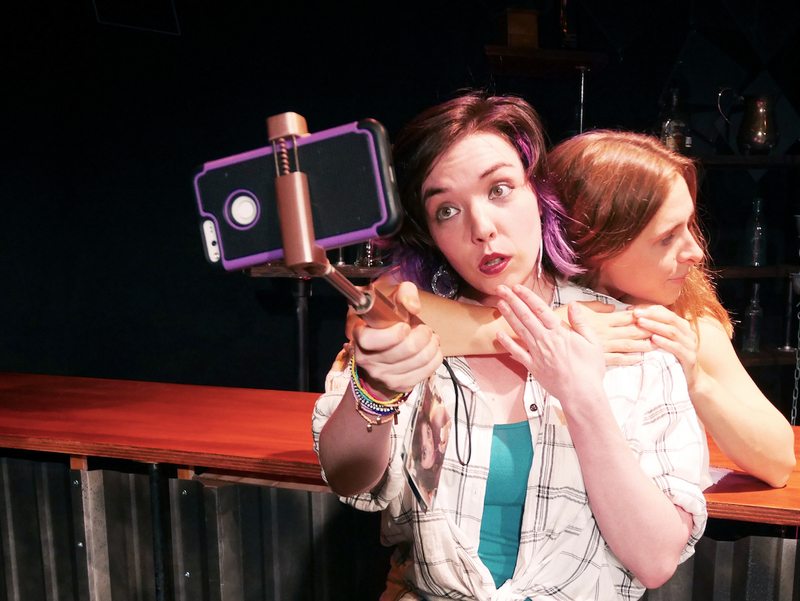 The 90-minute play takes place inside of a bar, which serves as stand in for the Facebook wall or other unnamed social media account of Maggie, who has recently passed away. Friends and family ‘gather’ to mourn her loss and share fond memories. 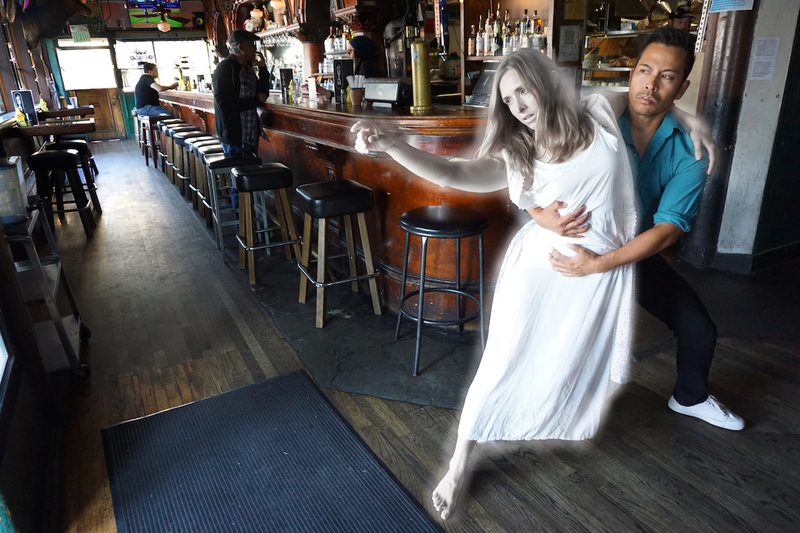 Maggie, dressed in ghostly white and played to perfection by Adrian Deane, is able to hear their mourning and is at times elated and angry to listen to their conversation. As they exchange memories and stories, it’s hard to escape the sense that these moments lose quite a bit of their emotional impact when you picture people writing them into a tiny box on Facebook, rather than actually looking each other in the eye. The play pivots from watching Maggie’s loved ones move on with their lives- falling in love, having a baby, even dying, while she is trapped in perpetuity, left only to respond to their annual memorials written on her social media page. As the actors fade into the background, hiding behind silver, sparkly masks, Maggie herself is able to give full voice her experience as their witness. The particular genius of this play is the contrast between the extremely new and modern convention of social media and how it has been used as a dedicated memorial for the deceased, with the elements of “Noh,” a form of traditional Japanese musical theatre that has its roots in the 14th century. The classic use of props in Noh works extremely effectively here to highlight moments of emotional intensity. The play also gives a nod to Noh’s frequent use of music, although in this case each character belts out one classic 80s song. The play takes a very honest, raw, thoughtful look at life, death, the grieving process and what it means to connect with one another. Sniffles could be heard throughout the audience at times as the play touches deeply on how to move on from great loss. Innovative theatre such as this is a dying art and San Francisco is lucky to still have enough arts supporters to keep Theatre of Yugen afloat. For more information about Theatre of Yugen, see their website. Whitney Merchant is that rarest of all birds, a Bay Area native who still manages to eek out a living in her native habitat, while complaining incessantly about traffic and how expensive everything is. She is a lover of all types of live music, but prefers to shake her tail feathers to hip hop, funk, dancehall, African, Brazilian and anything that comes out of NOLA. She is herself learning to sing and write music. If given the right incentives, she might even breakdance for you.